Have you ever seen a show on the Food Network called Diners, Drive-ins, and Dives? It's basically just Guy Fieri going all over the country trying different (usually family owned) food "joints". I have to say, I'm kind of addicted to the show because it's food that I want to eat! I LOVE diner food! It's usually diner food that is bumped up a little, though. It's usually made from scratch, or maybe it'll be about food that is slightly creative, or not exactly the norm, and sometimes it'll be WAY over the top! (Yes, you guessed it, those are usually the things I want to try!) And Guy Fieri kind of cracks me up every time he says something is "out of bounds", or "off the hook", or anytime he refers to "flavor town." Usually when I watch the show, I wait for a place that is close enough for me to visit, but if it's it's too far away, then I try to figure a way to recreate some of the dishes that are served on the show. This is exactly how this recipe came to be. I was watching the "What's For Breakfast" episode which featured a place in the Dormont section of Pittsburgh, PA, called the Dor-Stop Restaurant, (famous for its pancakes and other breakfast creations.) As soon as I saw this dish, I thought "I am SO making that!!" And that's exactly what I did. Basically I just kind of guessed at the amounts of things, but it's pretty straight forward. And wait'll you taste it!! As Guy said, the crunch is "money" and it tastes like a jelly doughnut exploded! LOL OMG so good! It's definitely a one way ticket to flavor town! So, if anyone at the Dor Stop is reading this, thanx for the French Toast idea! It's really awesome! And if I'm ever in Dormont Pa, I'll be sure to stop by! In a mixing bowl, cream the cheese and sugar together until smooth. Mix in the raspberry jam until well combined. Set aside. In a shallow dish, whisk together the eggs, milk, and vanilla. Dip the slices of bread into the egg mixture, flipping to coat both sides. Then place it in another shallow dish containing the crushed corn flakes, being sure the corn flakes coat all sides. Place in a hot skillet with a little melted butter until it's golden on both sides. 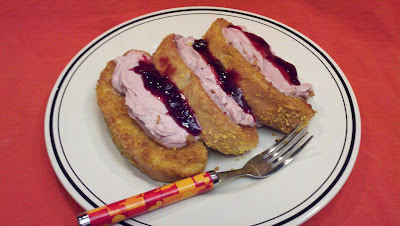 Serve French toast with a big dollop of the raspberry cream cheese and then top with a little more raspberry jam. Heaven! I tried it with regular bread, and I decided that the thicker bread was MUCH better. I have to say thank you so so much for posting this! I cannot tell you how many different ways I tried to find this recipe because I too saw this exact dish on diners drive ins and dives and fell in love but could not find it on the internet anywhere!!! So thank you again I will be making this very soon. You're very welcome!!! But most of the thanx go to the Dor Stop for coming up with the idea! Let me know how you like it!!! I too was able to catch this episode...so mouth watering good looking we had to try it as well. We use Texas Toast, which I believe is what they used in the episode. It's thick, hearty and tastes great! So glad to find this recipe...I usually have a tablet of paper ready go when I watch that show so I can jot the good stuff down - but seemed to have misplaced this recipe. So happy I was able to recall which cereal was used - saw a different episode where they used Captain Crunch, so wasn't able to recall if for this or the other. Anyway, thanks for helping with the cereal portion! So glad I could help!!! Now, remember, I was just guessing at the amounts, but I think it's probably pretty close!!! Let me know how it goes for you! !